Glad Creations Patterns > Just a Little Bit Modern - New! Just a Little Bit Modern was a mystery quilt in our 2013-2014 Scrap Tamers Club. 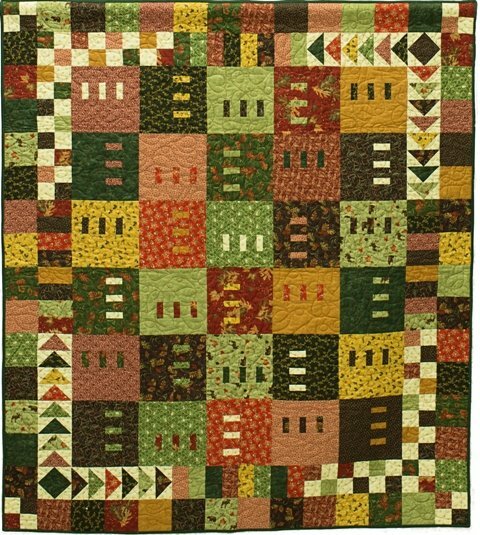 It has a more modern look than many of our Glad Creations quilts, but still seems to look traditional, with a pieced border and traditional quilt blocks. We have included instructions for either cutting from a planned group of prints or cutting from your stash. In this quilt you will be using 2 prints in each block, so you will need to have some difference in value or color within your fabric selection. There is also an “accent" fabric which is used in the pieced border and is also inserted as a little surprise in some of the blocks.